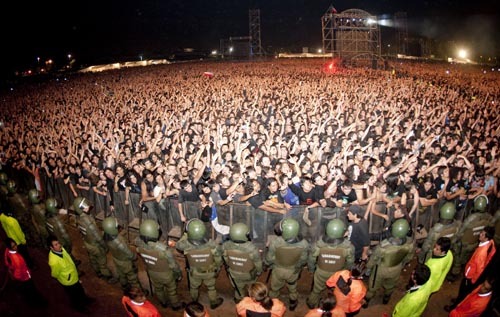 According to Chile’s La Tercera newspaper Iron Maiden is the biggest foreign concert draw ever in Chile, with a total of 226.000 tickets sold for the 7 shows the band has played there since 1996. 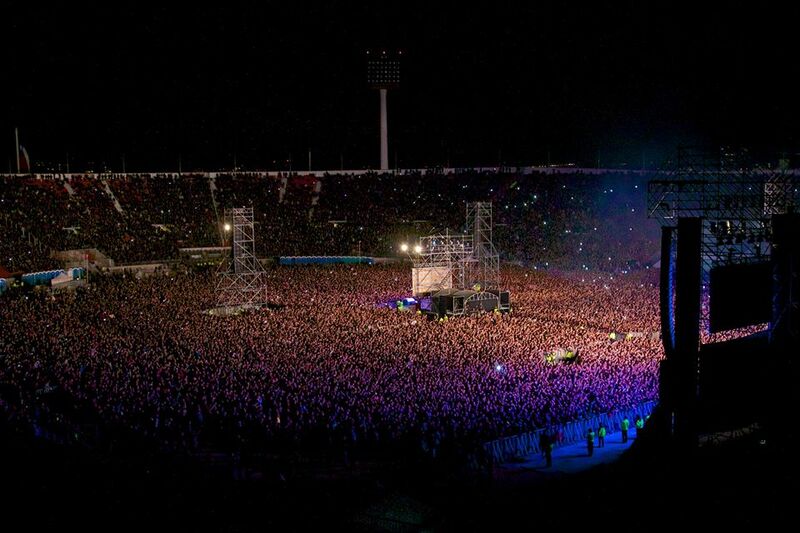 On October 2nd Iron Maiden finished their massive Maiden England 2013 World Tour in front of an audience of 60.105 spectators at the national stadium Estadio Nacional in Santiago, Chile. An interesting turn of events considering Maiden were banned by the Church from playing in Chile in 1992, according to the band’s official site. Last week the Chilean newspaper La Tercera reported that Iron Maiden is the biggest international concert draw in Chile ever with a total of 226.000 tickets sold for their 7 shows in the country. Maiden are snubbing massive acts like U2 (212.000), Roger Waters (195.000) and Madonna (182.000) from the number one spot on the list. The Maiden England World Tour is a celebration of the band’s glorious 1980s period, with a particular focus on the Seventh Son Of A Seventh Son album and tour. 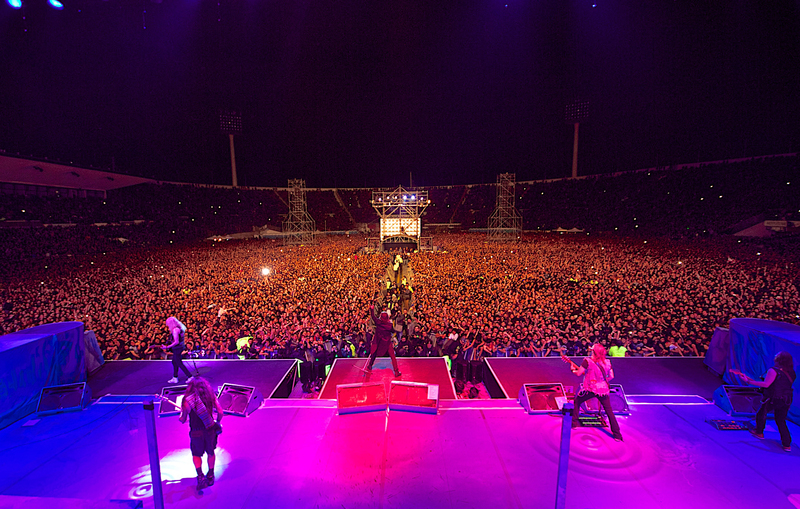 And the Chileans simply went crazy for yet another round of Maiden greatness! – Because we were banned in the ’90s, people have felt a very strong connection to us. And we have always brought great shows with us and worked hard not to disappoint the audience, frontman Bruce Dickinson told La Tercera outside the Sheraton Hotel before leaving for the gig. Since then it has steadily been going uphill for the heavy metal veterans, eventually leading the band to film their latest concert DVD En Vivo! at the Estadio Nacional in 2011, one of the many audience-driven concert films in the band’s long career. At some point, I don’t know who alerted them, but from the corner of my right eye I saw four Carabineros – the riot police – coming along the front of the stage from the right, with the helmets and the visors and the sticks…. One of them went past our security guys and as soon as these hundred wankers saw them, they ran. And here is some audience action from the same gig courtesy of IMTV 2009. See if you can hear Bruce! The Maiden England World Tour 2012-13 reaches its ultimate finale at Estadio Nacional, Santiago, Chile on October 2nd.